The Dawson Road park, also known as Fergusson Oaks, has a concrete stage structure that was desperately in need of a new mural. Past murals had been vandalised and so a new mural needed to have a stronger relationship with the surrounding community in order to inspire ownership. The video aimed to give artists an insight into what the community wanted to see in their park. Each participant gave us important insight and valuable inspiration for the final mural. Thank you Latisha, Etienne, Memory, Ina, Lawrence, Noah, Ezra, Jonathan, Boaza, Strickland, Sepania, Christian, Wesley, Don, Wynyard, Mele, Cassidy, Madason, Yasmine, Peina, Liana, Phillippa, Kenneth, Akanesi, Lolesio, Mathew, Moa and Michael! Originally, the designs were to be collated and voted upon by library users, but not enough designs were received. Instead, the team at Otara’s art gallery, Fresh Gallery Otara, developed a design that responded to the video emphasising the key themes locality – the Dawson area of Otara, youth culture, bright vibrant colours, Pacific and Maori patterns and importantly, an homage to Michael Jackson. Developed in-house by Manukau Arts staff Nicole Lim and Ema Tavola, the final mural design considered ease of painting within a relatively tight two-day timeframe and high visibility from Dawson Road. Three artists were employed to manage the painting of the mural with the support of 11 volunteers recruited from Tupu Youth Library. The lead artist was Samiu Napa’a, an Otara-based painter with training from Manukau School of Visual Arts. Samiu is an exhibiting artist who has participated in mural projects and arts workshops in and around Otara since 2003. Assisting Samiu were Sangeeta Singh and Luisa Tora, both south Auckland based artists involved with Fresh Gallery Otara. The 11 volunteers were: Kofe Aupeipeigamalie, Muavaefaatasi Brown, Simon Samuelu, Luma Aneti, Murphy Enekosi, Paul Lavea, Aaron Henry-Taripo, Ezra Ape, Joe Futi, Matagia Esera and Wylie Fong. 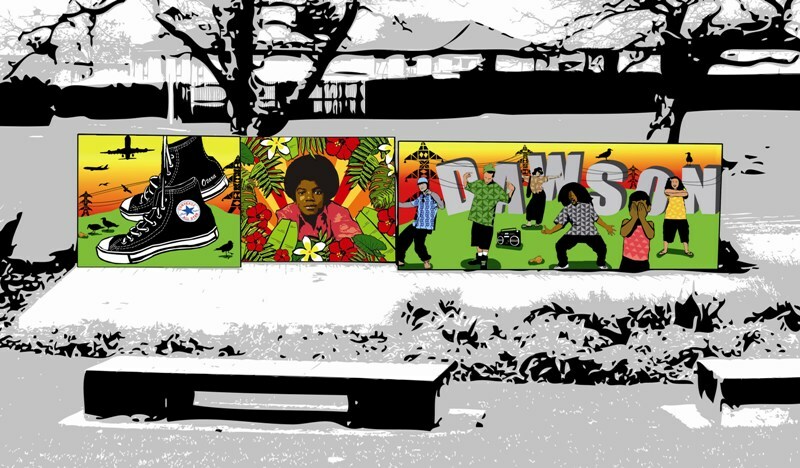 The Dawson Road Mural Project was a collaborative project between Manukau Arts, Manukau Parks, Manukau Libraries and Manukau Beautification Trust. This fantastic! Well done to all who participated.